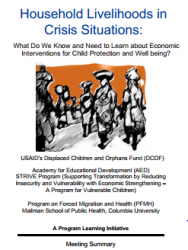 Household Livelihoods in Crisis Situations: What Do We Know and Need to Learn about Economic Interventions for Child Protection and Well being? Recognizing the need to explore livelihoods interventions and economic strengthening activities as they pertain to child protection and well-being in crisis settings, a workshop was held to identify key program learning needs in the area of livelihoods interventions and economic strengthening activities as they pertain to child protection and well-being in crisis settings. The workshop explored several key areas, starting with a focus on trying to understand children’s roles in household livelihood strategies, exploring different forms of crises, moving into several types of economic strengthening interventions and associated monitoring, evaluation and impact assessments, while continually identifying key principles of practice and learning needs in each of these areas. This is the final meeting summary of this workshop. Household Livelihoods in Crisis Situations: What Do We Know and Need to Learn about Economic Interventions for Child Protection and Wellbeing?